Results from the APIC MegaSurvey, the largest-ever survey of the infection prevention workforce, describe the core activities and competencies of infection preventionists (IPs). The first in a series of articles based on the survey findings was recently published in the American Journal of Infection Control (AJIC). APIC announces the 2017-2018 recipients of the Heroes Implementation Research Scholar Award program. Two $40,000 awards were granted for a 15-month project period (January 1, 2017 to March 30, 2018.) The recipients are: Eileen Carter, PhD, RN, and Misha Huang, MD. Linda R. Greene, RN, MPS, CIC, FAPIC, infection prevention manager at Highland Hospital in Rochester, New York, will serve as 2017 president of the APIC. “We are pleased that Linda will lead our association as 2017 president,” said APIC Chief Executive Officer Katrina Crist, MBA, CAE. Exclusively for APIC members! We are now accepting applications through March 31 for exemplary infection preventionists to apply for Fellow of APIC status. FAPIC is a distinction of honor for IPs who are not only advanced practitioners of infection prevention practice, but also leaders within the field. Portland, here we come! Registration and hotel blocks are now open for the 44th Annual Conference, June 14-16 in Portland, Oregon—the infection prevention event of the year. Join us! The schedule for EPI® Intensive courses in 2017 has been announced! This novice-level course, designed for infection preventionists with 1-3 years of experience, provides intensive fundamental infection prevention training for healthcare professionals working in different practice settings. APIC 2017 is an opportunity to present your research at the premier infection prevention event of the year, hosting more than 4,000 healthcare professionals from around the world. The call is open through December 15, 2016. The Heroes Implementation Research Scholar Award supports research that advances infection prevention through implementation science. Two awards of up to $40,000 each will be granted for a project period from January 1, 2017 to March 30, 2018. APIC added another flier to it's "Do's and Don'ts" infographic series with its latest: Do's and Don'ts for wearing gloves in healthcare settings. There are many types of gloves used in healthcare settings. APIC has developed this flier to help healthcare providers learn the proper ways and uses for this personal protective equipment. We encourage you to download these free fliers and share them with your healthcare facilities. Download this infographic. This year International Infection Prevention Week (IIPW) is October 16–22, and the theme is “Break the Chain of Infection.” APIC wants spread the message about how the public and healthcare professionals can help “Break the Chain of Infection” in healthcare settings and in the community. Learn more! Register for the free webinar at 10 a.m. ET on Tuesday, October 18, with the CDC featuring Dr. Benjamin Parks with an introduction from APIC President-Elect Linda Greene, RN, MPS, CIC, FAPIC. 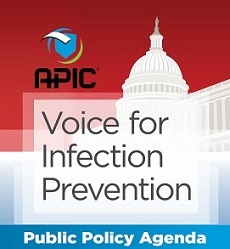 The APIC Graduate Student Award (AGSA) supports research that advances infection prevention and evidence-based implementation science and provides a total of $5,000 for project costs. Early registration is extended through August 15 for fall Infection Prevention Academy in Orlando, Sept. 12-17. The Academy offers top-level, hands-on training with the benefit of a conference experience—professional networking, an exhibit hall, and the APIC store onsite with special discounts. The highly anticipated Fundamental Statistics & Epidemiology in Infection Prevention publication provides a deeper understanding of basic statistics and epidemiology as they apply to infection prevention and control. The APIC Annual Conference Committee invites proposals for presentations for the 2017 Annual Conference to be held Wednesday through Friday, June 14-16, 2017 in Portland, Oregon. All presentations must be submitted online and the deadline to submit is Friday, August 5, 2016. Learn more. The Association for Professionals in Infection Control and Epidemiology (APIC) today presented Beth Duffy, chief operating officer, Einstein Medical Center Montgomery (EMCM) in East Norriton, Pennsylvania, with its 2016 Healthcare Administrator Award. The Association for Professionals in Infection Control and Epidemiology (APIC) today awarded Deverick J. Anderson, MD, MPH, associate professor of medicine, Duke University Medical Center, with the Distinguished Scientist Award.